Home » Casserole Recipes » Cracker Barrel Chicken Casserole – you can make this seasonal menu item anytime. Cracker Barrel Chicken Casserole – you can make this seasonal menu item anytime. Cracker Barrel Old Country Store serves up this good tasting casserole. You can still recreate this seasonal casserole from the Cracker Barrel with this copycat recipe. Crust Mix all together in mixing bowl until smooth. Pour into greased 8x8 inch baking pan and bake at 375 degrees for 20 - 25 minutes until done. Remove from oven and let cool completely. 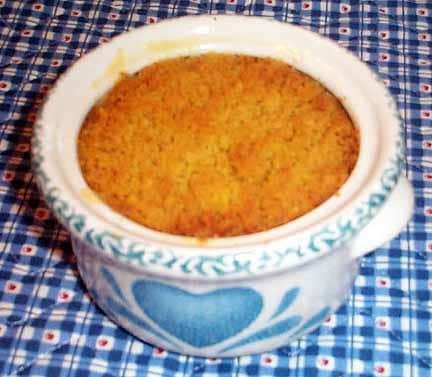 When cool, crumble cornbread and place 3 cups of cornbread crumbs in mixing bowl. Add 1/2 cup melted butter to crumbs and mix well, set aside. Chicken Filling In a saucepan on medium-low heat, place butter and saute onions and celery until transparent, stirring occasionally. Add chicken broth, cream of chicken soup, salt, and pepper. Stir until well blended and soup is dissolved completely. Add chicken; stir and blend until mixture reaches a low simmer. Cook for 5 minutes, remove from heat. Place chicken mixture in 2 and 1/2 quart buttered the casserole dish or individual casserole dishes (about four). Spoon cornbread crumb topping on top of chicken mixture (do not stir into chicken filling) and bake at 350 degrees for 35 to 40 minutes. The crumbs will turn a golden yellow. Add a side order of country green beans or salad for a hearty meal. Dear Jeanette – instructions clearly state “or individual casserole dishes (about four)” thus a wild guess is that this casserole might serve 4. My family really liked this casserole. Gary, the person who added in the time, did bad math or perhaps it is the new common core math where you kind of estimate things. Thank you for noting the math error and the weird character in the recipe. I have corrected this.